South Webster senior Shiloah Blevins giving the game ball to his mother after scoring his 1,000th point. The jumpshot that put South Webster senior Shiloah Blevins over the 1,000 point mark for his career. SOUTH WEBSTER – Friday night was a special night all the way around in the village of South Webster. 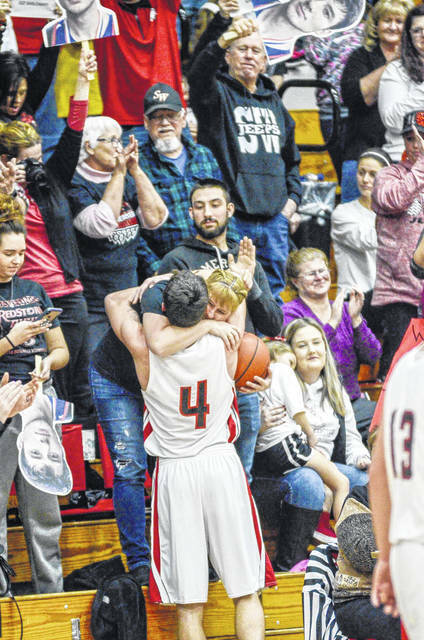 A home conference win over Northwest, 81-43, an all around great team performance from all of the Jeeps, and oh yeah, senior Shiloah Blevins scored his 1,000th career point in the late stages of the fourth quarter in front of the home South Webster crowd. That’s the kind of player and person Shiloah Blevins is. Until the fourth quarter, his teammates had no idea Blevins was that close to such a great accomplishment. Only his coaches, family, and those patiently waiting on the Jeeps home side of the court. The story of Friday night’s game, besides the feat accomplished by the Jeeps senior, was South Webster’s hot shooting and, guess what? Their defense. Sophomore Tanner Voiers got the Jeeps going offensive early and often by draining three long balls in the first quarter, leading his team with 11 points through the first period. Voiers led the Jeeps with a game high 14 points in the first half and remained at that number for the rest of Friday night’s contest. Towards the end of the first half, Northwest made a push to cut their deficit to fourteen at 40-26 entering the halftime break. Freshman guard Brayden Campbell had a team high nine points at the half and finished with a team high 12 points by games end. The freshman guard has made tremendous strides since the beginning of the season. As the game restarted following the intermission South Webster continually pulled away using their long range shooting and stellar defense en route to an 81-43 home win over the Mohawks. With just a week and a half left in the regular season before tournament play, Cole is going to continue to preach improvement on the two things that the Jeeps do so well: defense and shooting. 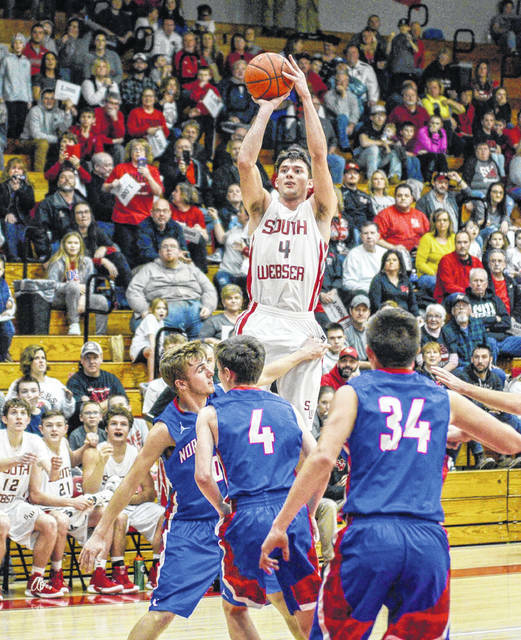 South Webster will be in action again on Saturday when they will face off against Clay in a non-conference battle. Northwest will travel to North Adams on Saturday in non-conference play.